That saying? Behind every famous man ...? From Mrs Midas to Queen Kong, from Elvis's twin sister to Pygmalion's bride, they're all here, in Carol Ann Duffy's inspired and inspirational collection, The World's Wife. Witty and thought-provoking, this is a tongue-in-cheek, no-holds-barred look at the real movers and shakers across history, myth and legend. 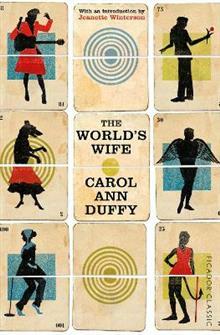 If you have ever wondered, for example, how exactly Darwin came up with his theory of evolution, or what, precisely, Frau Freud thought about her husband - then this is the book for you, as the wives of the great, the good, the not so good, and the legendary are given a voice in Carol Ann Duffy's sparkling and inventive collection. Carol Ann Duffy lives in Manchester, where she is Professor and Creative Director of the Writing School at Manchester Metropolitan University. She has written for both children and adults, and her poetry has received many awards, including the Signal Prize for Children's Verse, the Whitbread, Forward and T. S. Eliot Prizes, and the Lannan and E. M. Forster Prize in America. She was appointed Poet Laureate in 2009. In 2011 The Bees won the Costa Poetry Award, and in 2012 she won the PEN Pinter Prize.